I’ve been hankering for a change in the dining room lately. I’m going to paint the wood trim white (it’s on my 30 Before Thirty list), and I’d like to paint the ceiling too. The wallpaper is staying (I’m going to have to be very careful when painting the trim), and so is the rug. Now, while I do love my vintage dining set, I have been pining for new chairs. I can sell my current dining room set on Craigslist, and then use the money toward new furniture. I know the OLLE chairs are affordable, but the other chairs all have more graceful lines. OK, or I could just see how my vintage set (which I do not want to alter other than seat fabric) looks in the room once the trim has gone white. I like chair 3. It’s somewhat traditional and would match your vintagey wallpaper, but there is something slightly different about it’s structure. I love it! I would do all the painting first and see how you feel after that! I agree with Heather; paint first then re-evaluate the chair sitch. You may find the itch to change has been scratched. I agree with heather. Paint first (if you really must!) then consider the table and chairs. I’ve had the exact same dilemma (wood table, wood chairs and wood buffet cabinet) – it is too much solid wood, as well as too dark. I’m afraid that by doing a dark wood chair, you’ll be making the room appear smaller (this was my worry for my dining room). I also agree that the trim need to be painted white – that will also help to brighten up the room a lot – and will go better with the wall paper. i love the set of mismatched moma chairs. so cute! but i agree, maybe paint the white trim first and see what you’re feeling then ? I would wait until you paint and then decide as I think with white trim (gasp) the wood is going to look different. I have a weakness for anything Room and Board, so of course I dig #3. Painting the chairs would give me a similar look, but I don’t want to alter these. The wood on our dining set is beautiful, and it would be a shame to paint it. I’d rather sell the set to someone else and use that money toward new chairs. I love your current set. I agree with everyone that said wait until you paint to decide. I would buy your chairs if you were local to me – should that be what you decide! I would wait to see how your current table looks after you paint the trim white. Maybe change the cushions. A slate grey would probably look good. White trim first, then reevaluate! I agree you should wait and see how you feel with the white trim. It will really brighten up the room. The white trim and black chairs would be a much more graphic contrast — not sure if you want that with the already graphic wallpaper? I do share your love for spindle-back chairs, though. I scored an amazing set of Paul McCobbs myself not too long ago (chair #3 is a good knock-off version). Nicole, we would be VERY interested in buying the dining set. I had one very similar that I sold when we moved into our last house and I’ve always regretted it. Now, in the bigger new place, we have the space and I wish I had it back! Please let me know if you do indeed decide to sell. As an aside, I may be able to get wholesale pricing on some black spindle back chairs for you through the shop. The most important thing for me with the chairs would be comfort. Wouldn’t you want to sit on some before making a decision? I would definitely wait. Once the trim is all white (which I cannot wait to see by the way!) the dining set might add some warmth to the room that might be missed with the black chairs. I would wait too. But please let me know if you decide to sell your current set. I heart it! I would wait…that’s a great dining set you already have. See how it looks once the trim is painted, and maybe just change out the chair cushions. Your set looks very “solid”, and I think it would be hard to find a replacement equal to its quality. That’s exactly what we’re worried about. We would want whatever we get to have the same substantial, quality feel. I have the Salt chairs and while I love how they look, they are light as a feather — definitely not “forever” chairs. Good luck! Don’t part with that vintage table! I would keep 4 of your chairs, reupholster with a modern fabric (I would go white) and make a statement with your head chairs. i think painting the trim is an excellent idea. i also think you should keep your set – at least initially – and change the fabric. i’m not too fond of the pink fabric with the color of the wood. i like both separately but not together. how about something charcoal or oatmeal instead? I’m with the paint the trim first and then decide group. While I LOVE Ikea, I realy do, don’t get their chairs! Ikea is great but not so durable for things like everyday chairs that will be sat in, pulled in and out, maybe even stood on…you do have a little girl (wait, maybe 2 little girls! )to factor in. I worry that they would get wobbly quiickly, then you are just going to be back a square one. I love the lines of what you have already. You can really do a lot with painting and reupholstering. 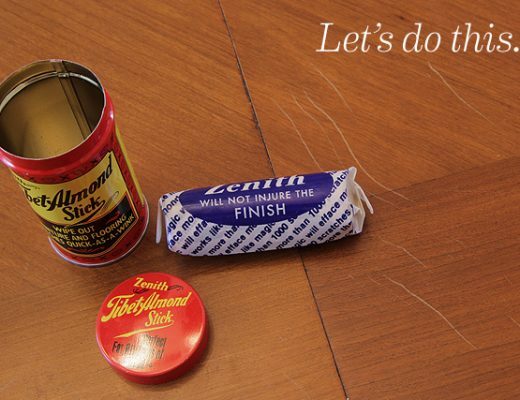 Design Sponge has a great tab with before and afters. Maybe you could get so inspiration there. Good luck and HAVE FUN! I see your point, but I’m going to disagree–at least with the OLLE. I’ve put the OLLE chairs from IKEA (in white) through five years of everyday use. (Nicole, how did you find them? I thought they were discontinued! )I have two boys, and so far they are hanging strong. Dirty, but strong. The only concern I have with the OLLE is size related. They are petite chairs, and I think a formal table should have chairs with a bit more heft. If you go with the spindle back make sure you sit on them first. I was so happy to get rid of mine—very hard and uncomfortable. That said, they are all beautiful, but I like the R&B the best. Don’t paint the trim! The natural wood is so beautiful and once you paint it it’s so hard to ever get the natural back. It would really be a shame to lose that in your classic dining room. I would go about this a bit differently because I think that the natural wood makes the room look more expensive than white painted wood. In the long-term, you’re house is worth more this way. I would start by painting the ceiling a slightly metallic shade of the background color in your wallpaper. That is going to really change the room and that sort of glow might make you like the real wood tones more (I think you need to get that pink fabric out of the cabinet right away to get a better feel for the change). Then I would go for the Room and Board chairs for the side chairs and get something cushy for the two end chairs- it makes it look so much more designer to have mixed chair styles, I think. I would stick to craiglist and then upholster to match the room. To be really chic and go with the same vibe as your chandelier, how about a fabric with a bit of shimmer to match the ceiling? I really agree with this comment. The natural wood trim is so fantastic and really adds to the value of the house. Painted wood trim, no matter how much you agonize over the color and paint it perfectly, is just never as special as the original wood. It’s really interesting to me that Nicole feels that the dining room set is too beautiful as natural wood to be painted, but doesn’t feel the same way about the delicious natural wood trim in the room. It’s way easier to replace a dining room set that you get tired of or feels dated – you are going to live with the repercussions of painted trim until you sell the house. Paint the trim, then decide. I’ve thought for sometime that there is wood overload in your dining room, but I think I’m just more sensitive to these things because I live in a country where you are inundated with pine EVERYTHING. I would honestly paint the trim white, then see how you feel about furniture. I had a similar issue in my house. In the end, I kept my furniture because it ended up looking so lovely with my freshly-painted, white trim! I love the first chair with the ‘X” on the back! The OLLE chairs might be affordable, but they don’t look very substantial. Like others have mentioned painting the trim white will definitely make your current set pop, and you may love it all over again! Tough decision! I have 4 of DWR’s Salt chairs only after purchasing the Ikea Olle chairs and being so disappointed in their quality. They are very rickety, while the DWR (which we purchased on sale) have not disappointed. Solid and have a more finished look about them. Good luck, though your current dining room is really cute as is! We painted our wood trim white in our dining room and I LOVE it so much better. I love wood, but hate wood trim. 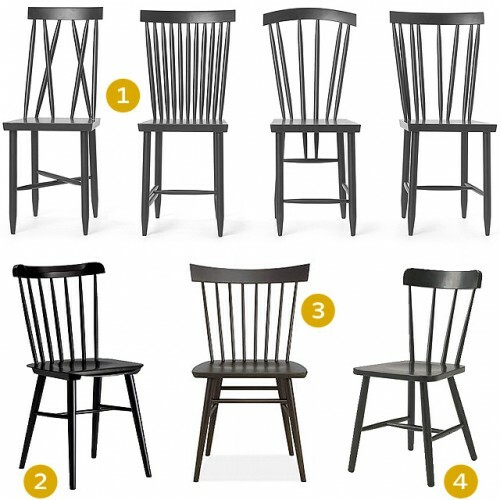 I like all the chairs you picked out, especially #4, but I’m not sure I like them in black. I like #3 if you purchase new black chairs. The hard lines seem to match your existing set the best. I love your current set, and especially with your bungalow/craftman house, it complements the house so wonderfully. Plus, black is in need of constant dusting. I agree with the above: Wait until after you paint the trim, then decide. Really, I think everyone above is just saying “No! We love your current set!” but objecting in a polite way. I love that wallpaper! I have ever since you put it up. Oh, don’t paint that trim! It’s part of the charm of a craftsman home! Are you planning to paint the hutch and the door frames and everything? If you paint the trim, you should paint the door frames, too, I think. But maybe you should postpone painting untill the new baby is born and you have stopped breastfeeding, as there are many harmful things in paint. Yes, painting everything. I might leave the beadboard at the back of the hutch the natural color, but I’ll have to see how that looks. I agree with “paint the trim then see what you think!” :) I think you could achieve the same effect with recovering the seats in black. If you are afraid the kids might damage the set, why not create a custom chair cover out of washable fabrics for just two of the chairs. Then once they are a bit older you can lose them! I like the ills chairs… I’m getting them in red! I think black dining room chairs would look so crazy awesome in this room, but maybe that’s just me. I’m with Tracy…when you say painting “the trim,” do you also mean you’ll be including the wood door frame & built-in hutch? If so, that will transform the look of the room SO MUCH, you’ll need to see what color dining set will look best! I went to the press event for the new IKEA catalog in Germany the other day, and they had put up dining tables and several different chairs to sit on. I didn’t sit on the Olle chair, but everyone who did said how uncomfortable they are! I think the round spindles in general have a tendency to be uncomfortable. I sat on the Norrnäs chairs the whole night and they were super comfy! But I agree with a lot of the other commentors- paint the trim first and then see if you really want new ones! I have to chime in about painting the trim too. I’m in the midst of spending many months stripping the woodwork in my new house. I grew up in a house where it was all painted white, so I sometimes miss that look and feel like all the wood “color” is a bit much. But it’s SO tedious to go back, and you lose so much of the detail in the carvings when it’s painted. I would kill to have your hutch in that condition. I have to add this: Why not paint the trim of the doors/floor boards/frame of the hutch but NOT the “interior wood?” It would really brighten the room, but still leave a little sampling of the original wood “color” for progeny’s’ sake. I would paint the trim & reevaluate – but I do love a good spindle chair. The salt and Thatcher are almost equally pretty, IMO. The number 3 Thatcher Side chair from Room & Board looks a LOT like a Nakishima chair — elegantly simple, but the curves are proportioned nearly as wonderfully as the Nakishima…. I wouldn’t paint that gorgeous natural wood trim. It looks beautiful the way it is and looks so nice with the built ins. It also matches your current dining set so well. It all just looks so perfect now. I get wanting to always change things but if it aint broke, don’t fix it. I can see painting the ceiling though if you feel the need. Change out the fabric on the chairs and it will give you a new look. If I got new chairs, I would not get any with low “spreader” bars, for lack of a better word, unless they were really stout, because little kids like to use them as a step to climb up on your lap when you’re sitting in the chair. My son has broken two of ours in this manner. So I would go with either the first one in the top row or one of the first two in the lower row. You are blessed to have a nice set already. As your kids get older, you might want the faux leather for sure. I think black faux leather on your current chairs would be nice. I wouldn’t paint the trim, either. But I would def. paint the ceiling. There is so much you could do with that! I would paint the trim and then see how it all looks. We purchased the IKEA Ollie chairs last year for our summer home in Wisconsin and found the quality lacking. (We had to return two even before assembling since the wood was split.) Hold out for quality rather than a quick design statement. You need 6 chairs think about the price. Have you considered painting the trim a charcoal gray instead of white? Then paint the back of the hutch an unexpected color, like turquoise or chartreuse. Then re-evaluate the chairs. I personally love those chairs more than any of the others you showed; the quality and style is better & more interesting than what you see in showrooms every day. 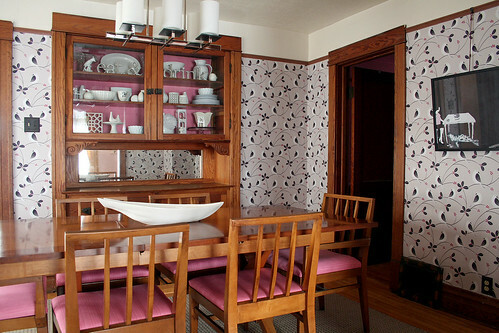 Definately consider reupholstering the seats – find something that correlates to the wallpaper and that punch of color in the hutch to pull it down into the room. You’re not going safe anywhere else in the house; don’t do it in your dining room. Adding to the above; if you MUST replace any chairs; move two to another room and get two new ones for the end. I’m with the wait and see group. Once you paint you may have a different perspective. I really wouldn’t paint the trim – I lived in a vintage condo and stripped woodwork for months to get the wood back to the original finish – you are so lucky to have that. I do love the MOMA chairs. Maybe you could go for vintage spindle back chairs. They come up all the time in charity shops, excellent quality and really cheap. If they’re mismatched, all the better, especially if painted with a single distinctive unifying colour, like pink! And I’d say totally paint the trim. I vote go for NEW! The MOMA chairs are really cool too. 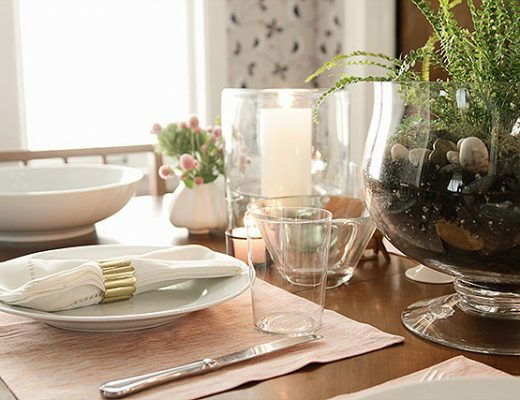 What about a white table and black chairs…then add color with place mats and center pieces. White trim is a great addition…I know with these classic homes it’s hard to do (your heart says paint it!) but it really cleans it up and makes for nice decorating options too. Also not sure if you are big on SW paint…but they have an exterior paint that looks great on trim. It’s the “sherlastic” line. It goes on super smooth, only one coat and the white is a nice shade. Oh and if you are painting windows with this stuff it works great too! Just not sure if it comes in 1 gal or 5 gal buckets. Good luck and keep us posted! Oh no! Seeing your wood trim 3 years ago is what kept me from painting mine. I have literally showed a picture of your trim and floors to my floor guy. I’m afraid if you paint, I’m going to have to paint too! Can’t wait to see how it turns out. Once you paint the trim in the room, I think you will like the table much more! Right now, it is a bit of oak overkill. But to give your current chairs a new twist, why not paint just the 3 inside spindles black and then change the seat fabric to some faux leather or something similar. Then, if you still don’t like the table you can sell it on craigslist. Before you do anything to the table, I would paint the trim. I think that table is going to POP as soon as all that trim is painted white! I love the wallpaper, it will look wonderful and fresh with the white trim. I think I would paint the trim then try out the plywood chairs with the existing table and some punchy modern placemats ( like maybe square, lime green). Or keep the chairs and do the seats in something punchy and fun ( like marimekko?) Not a fan of the black spindle chairs myself. Can’t wait to see what you do:). BTW, Interior Express http://www.interiorexpressoutlet.com in Bensenville has decent knock offs of the Eames shell chairs. -Ghost chairs, too. Paint the trim and then see how you feel about the dining set. Don’t sell the table and chairs….it is beautiful and classic!! Paint first, your set will look more striking without all the other wood distraction. I have seen the mismatched table and chair look and it has its place but not when you already have this lovely set. Your dining table and chairs look like a place where people would want to lounge & linger over dinner & coffee. Go for form & function and know that your guests will much prefer these chairs, recovered or not, for many years to come. I agree that you should paint first and then see about switching out the fabric on the chairs and then evaluate. Your dining room set is gorgeous and while I love the spindle back chairs, I love the look that your current set has even more. I love the family chairs, now I’m thinking, how much could I possibly get for my chairs that I have now. Hmm, probably not enough. I may be in the minority here but I would definitely not paint the trim! It looks like very nice trim and nice wood trim beats painted trim any day. Especially with kids! Painted trim gets dinged up so quickly and easily – no matter how good the paint job and how careful you are. For chairs I’d go for something not too fussy. I’d lean toward white – something more along the lines of the shell chairs. If you do paint the poor woodwork then I’d stick with the set you have. Or you could always leave it be. I totally understand the need for change but it really looks great the way it is! Try a new seat fabric first and maybe that alone will satisfy the need for change. Another idea – that ceiling would be awesome punched up in an bright turquoise or aqua. Wouldn’t work with your wallpaper but it’d look great next to the woodwork! MOMA chairs = SUPER pretty. However, I think your old dining suite is gorgie-oso!! I reckon you are just bored of it – which I get but – gorgeous, solid, quality dining suites are HARD TO FIND! Sit on the decision till you have painted the trim and what about some chartreuse vinyl on the chairs?? Paint the ceiling, switch out the furniture (although I would kill for that dining set), do other things to punch it up…but it is so rare to find craftsman woodwork in it’s intended natural laquered state, and your room is so beautiful with that hutch. Your dining room is my favorite room in your house, and your lovely taste, especially in your wall paper choice, really shows. I can’t imagine why you would want to change it so drastically when it’s only been decorated like that for a couple of years. Next thing, you are going to be changing up the reading nook, and then I am going to seriously cry. I haven’t read all the comments, so I might be re-stating here. I find spindle chairs to be incredibly uncomfortable. Also once the trim is white, I think you will really love the warmth that your beautiful dining set brings to the room. I would, however, totally recover the chairs and if you’re craving black, why not incorporate it in your fabric choice? I love your chairs. I’d just switch up the fabric on the chair pads. I would wait to see how the trim and the painted ceiling will be and then decide the other changes. My parents have a beautiful old wood table and modern chairs with a very simple, clean lines in black (similar to the Frankfurter chair) and it looks great, so I am particular to the concept of old wooden table and new black chairs. While the chairs you consider have a little bit more detail on the other hand your wood table has less details so I am sure your table and the new chairs would make a dreamy couple as well. And while I like Ikea I would go another route this time and invest in the chairs you really love. Your at a point in your life where you know what you want and have an idea how your life is going to be in the next few years so you can invest a little bit more in something you will keep for a long time. Check out the International Concepts Copenhegan chair for $99 on Walmart.com or csnstores.com. It is similar to the Thatcher but is unfinished–black stain you apply yourself is more durable than black paint. Target used to carry it too but they are only showing a prefinished version right now. Amazon also has them for $89 with free shipping! I just bought a black junior chair like these for my 3 year old daughter, from Ikea….so if you go for the chairs, Eleanor could have one in her size too!! Aw, now I really want them so I can have a matching little chair! I love the Olle chair from Ikea, I’ve thought about it for our own dining room. All the spindle chairs are great choices and that mixed 4 pack from Moma is a winner. The black would look amazing with that wallpaper. I’m really into spindle chairs too … I love mixing them with other modern decor. Plus they’ll last a lifetime. My fave is #3. First time reading your blog, but you have the same opinions about painting wood as I do, if it makes you happy do it (plus I hate the grain of oak, when I painted my oak kitchen cabinets in my last house my dad warned me, “you know, people kill people like you for what you just did…” really…I’m still here. in fact my new kitchen has oak but stained very dark, and i wish everyday it were white like the last one. i know eventually i will paint and glaze it like the last one…) anyhow, as for your dining room, paint the trim *fab*, as for the dining room, i don’t think you will be happy with your set once that is complete, *sad* but you won’t. keep the table, put a nice white linen cover on it it’s beautiful, change the chair covers to some updated fabric, such as zebra stripes, scrolls, something traditional-modern, keep three in the house, use them as landing spots and chairs, by the front/back door, in front of your bed in lieu of a bench, by the stairs, etc) if it were me, I would stain them all a dark black and call it a day. I did that with an antique duncan fiffe (sp?) set I didn’t want to paint (because of the same issues). It is black but you can see all the variations of grain, best of both worlds and I changed the chair covers. It was more work, but worth the effect. I have had wooden chairs at my dining table. I like to linger and talk and have my table be a place to be comfortable and sit a while. Now I have comfy chairs, and that actually happens now. Wood chairs hurt people’s tushies and made them beat retreat from my dining table. Something to consider… Function over form. hi nicole, i don’t know where you are at with this project since the post was a while back but fyi i have the dwr salt chair and it is very uncomfortable. if you still like the stick back or windsor style i suggest looking about for antique ones since they last forever and are much more comfortable. good luck! I’m a new reader and thoroughly enjoying myself today perusing through your blog. My West Elm catalog came last night and they have new spindle back chairs in black that are to die for. Had to share them with you in case you haven’t seen them yet. I think the combination of the white trim (assume you will also paint the built-in curio), the heavy oak table and the spindly-new black MOMA chairs (the ONLY choice here!) would be so fresh. You could do four and then maybe find two different ones for the ends of the table…maybe white, or keep two of your current oak and paint them white? And wood chairs are so practial with kids…mine are fabric covered and I have messy little boys! Whatever you do, I know I will love it and can’t wait to see it. Change is good, and so much cheaper than moving.